Toxoplasmosis, an infectious disease caused by a single-cell protozoan called Toxoplasma gondii, is typically diagnosed by testing blood and other body fluids for immunoglobulins (also known as antibodies) that are produced by the body in response to the infection. Molecular techniques can be also used to detect that parasite's DNA in tissues and body fluids. While the parasite can be directly observed under the microscope in tissue or spinal fluid samples, this form of testing is used less frequently because of the difficulty in obtaining specimens. An antibody test is one that measures specific immunoglobulins in your blood. Antibodies are proteins made by the immune system to fight antigens such as bacteria, viruses, and parasites. Each is tailor-made to combat a specific antigen. Once an antibody has been produced, it will remain in your bloodstream to protect against future infections. The persistence of antibodies not only provides us a long-lasting "footprint" of the infection, it can sometimes even tell us when the infection occurred. Immunoglobulin G (IgG) is the type found in all body fluids. While IgG antibodies quickly decline within a month or two of the initial infection, they generally persist for a lifetime. Immunoglobulin M (IgM), found mainly in the blood and lymph fluid, is the first antibody produced by the body to fight the infection. While it can provide early evidence of an infection, it only persists for around 18 months at most. 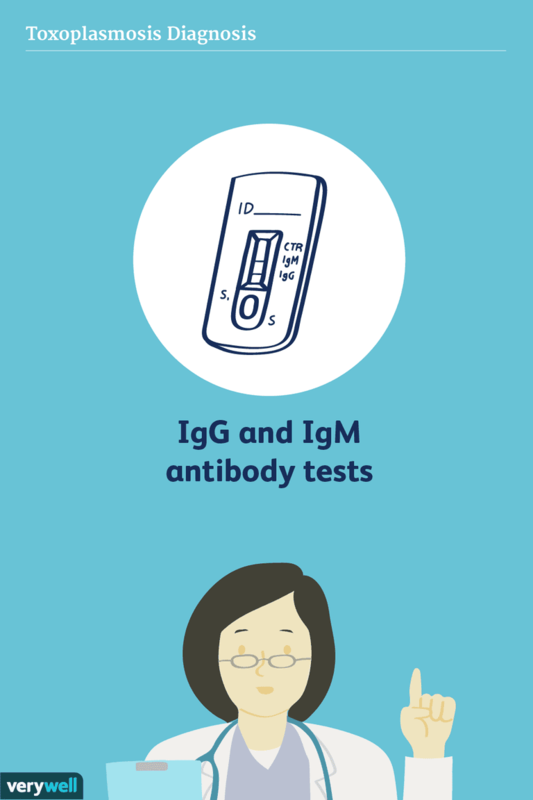 The IgG antibody test is the first test used to determine whether you have been infected with T. gondii. A positive IgG result simply means that you have been infected at some point in your life; it cannot tell you when. The IgM antibody test can tell us whether the infection was recent. A negative IgM result usually means that you've been infected in the past and are now immune to the parasite. While a positive result may suggest a recent infection, the results are often marred by the low specificity of the test (meaning that it is more likely to deliver a false-positive result). To this end, the IgG and IgM results need to be interpreted together in order to deliver a confident diagnosis. The interpretation is largely based on the level (titer) of antibodies in the test, with higher values generally corresponding to a greater level of certainty. If there is any doubt as to the interpretation, specialist consultation would be needed. You are not infected with T. gondii. You may have an acute (recent) infection or a false-positive IgM result. Retest IgG and IgM and, if the results remain the same, you are probably not infected. You may have an acute infection or a false-positive IgM result. Retest IgG and IgM and, if the results remain the same, the IgM result is probably a false-positive. The result is inconclusive. Retest IgG with a different testing technology. The result is inconclusive. Obtain a new IgG and IgM sample. You may be acutely infected. Retest both IgG and IgM. You have been infected with T. gondii for less than six months. You have either been infected for more than a year or have a false-positive IgM result. Retest IgM. You have been infected within the past 12 months. If you are pregnant and test positive for both IgG and IgM, your doctor will want to establish when the infection took place. For this, the doctor would need to perform an IgG avidity test. Avidity refers to the strength of the bond between an antibody and an antigen. Avidity increases over time and based on the level of bonding can give us a pretty good idea as to when the exposure occurred. As such, low avidity means that the infection occurred recently; high avidity means that the infection took place some time ago. With regards to toxoplasmosis, a high-avidity reading in the first 12 to 16 weeks of pregnancy means that the infection is not current and, as such, poses little risk to your baby (since the parasite will have gone into a state of inactivity known as latency). A low-avidity reading, by contrast, suggests that the infection is current and that additional interventions will be needed to either prevent mother-to-child transmission of T. gondii or manage serious disease complications. Ultrasounds may be used to check for any symptoms suggestive of congenital disease such as hydrocephalus ("water on the brain"). While useful in detecting fetal abnormalities, an ultrasound cannot diagnose toxoplasmosis nor exclude toxoplasmosis if the results are negative. Amniocentesis may be performed at 20 to 24 weeks if symptoms are suspected. The fluid would be tested with a technology known as polymerase chain reaction (PCR) which amplifies the numbers of T. gondii DNA in a lab sample. While a PCR can be used to confirm the infection, it cannot tell us how established or extensive the infection is. Antibody tests can be performed on umbilical cord blood at the time of birth to evaluate the status of the baby. Comparative mother-to-child blood tests may also be performed. A lumbar puncture (spinal tap) may be used to extract cerebrospinal fluid (CSF) for evaluation with a PCR. Even if the baby appears symptom-free, routine evaluations would be scheduled for the first year of life to monitor for any neurologic (brain) or ophthalmologic (eye) complications. Toxoplasma encephalitis, characterized by inflammation of the brain, is a serious complication most often seen in people with advanced HIV. It is typically diagnosed with imagining tests or an evaluation of brain tissue samples. Computed tomography (CT) ​scans remain one of the primary modes of diagnosis. It is a form of X-ray that can produce cross-sectional images of the brain. Toxoplasma encephalitis will typically manifest with multiple brain lesions that are significantly thinner than the adjacent tissue (suggesting a decreased blood supply). Intravenous contrast dyes can be used to enhance the images. Magnetic resonance imaging (MRI) uses magnetic waves to create highly detailed images of the brain architecture. When used with a gadolinium contrast dye, MRIs can often pick up smaller lesions that a CT scan might otherwise miss. If the doctor is unable to make a definitive diagnosis, a brain biopsy may be needed. The procedure is usually performed by drilling a small hole into the skull and extracting a tiny piece of tissue with a hollow needle. Microscopic examination of the biopsied tissue will usually reveal T. gondii in its active, replicating state. While a needle biopsy is less invasive than other methods of extraction, complications can sometimes occur, including infection, seizure, and cerebral bleeding. Ocular toxoplasmosis is another complication primarily seen in severely immune-compromised people. It may affect the uvea (uveitis) or the retina and choroid (retinochoroiditis), leading to the formation of lesions in one or both eyes as well as areas of tissue death (necrosis). Ocular toxoplasmosis is usually diagnosed based on the clinical appearance of the lesions and the results of IgG and IgM antibody tests. Negative IgG results can usually rule out T. gondii as the cause. In severe cases where the risk of vision loss is high, fluids may be extracted from the eye for evaluation with a PCR. There are a number of non-invasive photographic techniques used to determine the extent of the eye damage. Chief among these is autofluorescence imaging in which the use of a blue light can cause certain parts of the eye to "glow" without the use of dyes. It is a valuable tool able to show both active lesions and areas of retinal scarring. Toxoplasmosis can be difficult to distinguish from other diseases, particularly in people with compromised immune systems who are prone to multiple infections. To deliver a definitive diagnosis, the doctor will often need to exclude other illnesses with similar features. The list may seem long and confusing, but know that your doctor will want to consider every possibility in order to tailor the appropriate treatment. Centers for Disease Control and Prevention. DPDx - Laboratory Identification of Parasites of Public Health Concern: Toxoplasmosis. Atlanta, Georgia; issued December 18, 2017. Ozgonul, C. and Besirli C. Recent Developments in the Diagnosis and Treatment of Ocular Toxoplasmosis. Ophthalmic Res. 2017;57:1-12. DOI: https://doi.org/10.1159/000449169. Pereira-Chioccola, J.; Vidal, J.; and Su, C. Toxoplasma gondii infection and cerebral toxoplasmosis in HIV-infected patients. Future Microbiol. 2009;4(10). DOI: 10.2217/fmb.09.89. Pomares, C. and Montoya, A. Laboratory Diagnosis of Congenital Toxoplasmosis. J Clin Microbiol. 2016; 54(10):2448-54. DOI: 10.1128/JCM.00487-16. Villard. A; Cimon, B; L'Olivier, C. Serological diagnosis of Toxoplasma gondii infection: Recommendations from the French National Reference Center for Toxoplasmosis. Diag Microbiol Infect Dis. 2016; 84(1):22-33. DOI: 10.1016/j.diagmicrobio.2015.09.009.